Markey Electric and Solar is your warehouse electrical contractor with the experience and knowledge to handle large-scale industrial electrical projects. The size and scope of a warehouse require an electrician who specializes in this type of environment. Markey Electric and Solar have been handling warehouse projects for decades, and we can help you with every part of your plan. Because of their sheer size, every warehouse needs to have a functional electrical design in place. This design must meet requirements from city codes and regulations, as well as your business needs. The first step in assessing your project is by looking at the electrical design of your space and determining where we can make improvements. We can recommend solutions to create a more efficient and dynamic electrical design for your warehouse operations. Improvements in design and layout not only ensure the safety of your workers but also maximize energy efficiency. Having a more efficient system means that your investment will save you money on energy costs. More savings on your electric bill means more money back into your business. A smart design plan is nothing without quality electrical equipment. There are many components to consider such as your electrical panel, wiring, power output sources, meters, and lighting sources. We understand there are many decisions to consider when it comes to choosing the right equipment, and it can seem like a daunting task. However, our main priority is meeting our customer expectations. We help you select the equipment that meets your budget and provides the most value for your company. 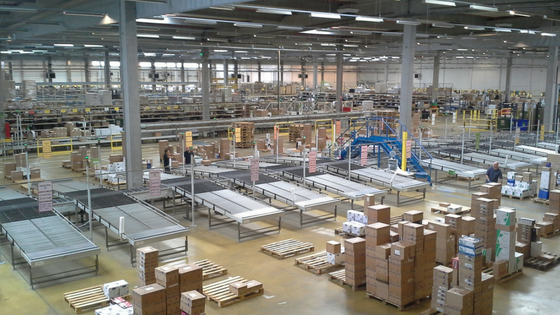 Warehouse spaces require much electrical energy to run on a daily basis. If you don’t keep an eye on your power sources, your energy consumption costs can quickly skyrocket. Many warehouse buildings in Los Angeles are old and have outdated electrical systems. One of the best ways to upgrade your electrical and maximize energy efficiency is by making the switch to LED lighting. LED provides better illumination, saves energy, and requires less maintenance than other forms of lighting. Also, Markey Electric and Solar can save you money by completing an LED Retrofit. A retrofit allows us to only change the electrical components that are necessary without having to replace every light fixture. Learn more about LED retrofits here and contact us for a free lighting audit. Once we’ve completed the installation process, our work never ends there. Markey Electric and Solar is the electrical maintenance provider that you can count on for all of your maintenance needs. Regular maintenance is the best way to make sure your warehouse electrical equipment is running optimally. Markey Electric and Solar is your trusted warehouse electrician. Contact us today.